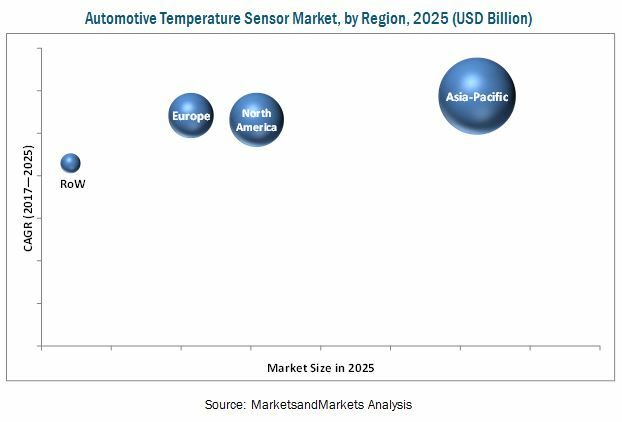 [182 Pages Report] The automotive temperature sensor market is valued at USD 7.21 Billion in 2016 and is projected to grow at a CAGR of 5.58% during the forecast period, to reach USD 11.89 Billion by 2025. In this study, 2016 has been considered as the base year, and 2017 to 2025 as the forecast period, for estimating the market size of the automotive temperature sensor market. The report segments the market and forecasts its size, by volume and value, based on application, product, usage, technology, EV application, EV charging technology, vehicle, and region. The research methodology used in the report involves various secondary sources such as Automotive Component Manufacturers Association (ACMA), Automotive Electronics Council (AEC), International Organization of Motor Vehicle Manufacturers (OICA), and others. Experts from related industries and suppliers have been interviewed to understand the future trends of the automotive temperature sensor market. Both, bottom-up and top-down approaches have been used to estimate and validate the size of the global market. The market size, by volume, is derived by identifying the region-wise production volume of vehicles and, by value, is derived by multiplying the average selling price of temperature sensor by the number of temperature sensors installed in the automobiles of that region. The ecosystem of the automotive temperature sensor market consists of manufacturers such as Robert Bosch (Germany), Continental (Germany), Panasonic (Japan), Delphi (UK), TDK Corporation (Japan), and research institutes such as the Automotive Component Manufacturers Association (ACMA), Automotive Electronics Council (AEC), and others. The global automotive temperature sensor market is estimated to be USD 7.70 Billion in 2017 and is projected to grow to USD 11.89 Billion by 2025, at a CAGR of 5.58%. The automotive temperature sensors are used for sensing the temperature of liquid and gases in a vehicle. Hence, they are used in various components of a vehicle to sense and monitor the temperature. 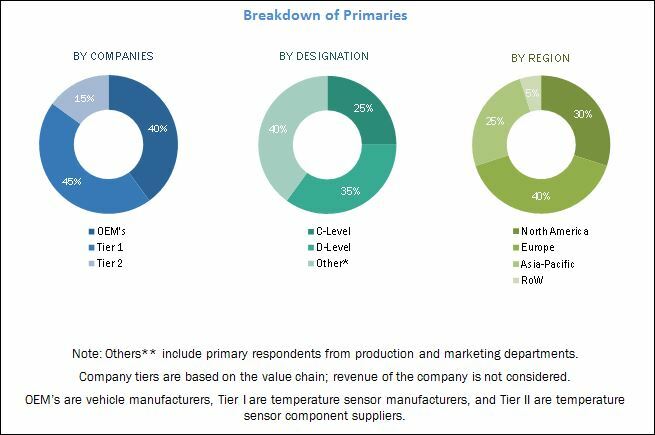 The automotive temperature sensor market is segmented by application into the engine, transmission, engine, HVAC, exhaust, and thermal seats. The engine is estimated to hold the largest share of the market, by application. Automotive temperature sensors for the engine are used in the engine air intake and cooling fluid. By product, the market for MEMS temperature sensors is estimated to experience the highest growth during the forecast period. With the development of advanced technologies, the use of advanced MEMS temperature sensors has increased. MEMS, IC sensors, and infrared temperature sensors are expected to be future technologies, due to increasing luxury vehicles around the globe and reduction of the wiring harness. The MEMS temperature sensors are widely used in all major advanced applications of electric as well as conventional vehicles. By EV charging technology, the market for wireless charging technology is expected to grow at the highest rate during the forecast period. Technology in the automotive industry is constantly evolving. Wireless charging systems for electric vehicles are gaining popularity as they can efficiently charge electric vehicles without the need to plug in wires or cords. Manufacturers are therefore developing this technology to improve efficiency and provide a more convenient way to charge vehicles. For instance, in 2016, Mercedes announced the availability of wireless charging in early 2018 for its S550e plug-in hybrid luxury sedan. Asia Pacific is estimated to lead the automotive temperature sensor market during the forecast period, followed by North America and Europe. The market in North America is expected to witness a slower growth rate as compared to the Asia Pacific and Europe. Due to stringent government regulations, the majority of the vehicles in North America are equipped with safety features. Hence, there is a limited scope of growth for temperature sensor applications in the region. The North American automotive temperature sensor market is set to mature in the near future. Automotive temperature sensors are mainly custom-made and are designed according to the requirements of automotive manufacturers or system suppliers. Depending on the application, the specification for a temperature sensor varies, which increases the cost of a sensor. Automotive temperature sensor manufacturers cannot reduce the cost due to a lack of mass production. The global automotive temperature sensor market is dominated by a few players such as Robert Bosch (Germany), Continental (Germany), Panasonic (Japan), Delphi (UK), and TDK Corporation (Japan). *Details on Overview, Products Offered, Recent Developments, SWOT Analysis, and MnM View Might Not Be Captured in Case of Unlisted Companies.